1. What is your favorite flower right now? My very favorite flower is an anemone, but depending on the time of year, I have lots of favorites. In the fall here in Colorado our farmers grow the most incredible dahlia’s and so they are a very close #2! 2. Do you find Pinterest to be helpful or harmful with styling florals for weddings? I love Pinterest! The way that I use Pinterest is solely for inspiration and ideas. We use it for colors, or general and fun ideas, but I never copy a specific image because I feel like each wedding should feel unique to my clients and their personalities. 3. Splurge vs. Save; What’s your opinion on silk flower resurgence, and the benefits of real flowers? 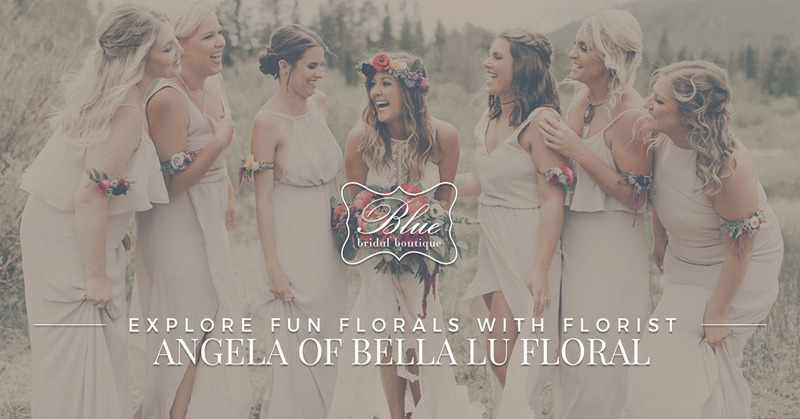 Real flowers all the way for weddings and events! Silk flowers don’t have the smell or soft texture. I love how real flowers open up further and further and then give off a fresh and fragrant smell. To me, you cannot beat what mother-nature gave us! I think there is a misconception out there that somehow you’ll spend less with silk, but that really isn’t the case all the time. I do use silk for flower wall installations and other times when a client might come to me for something that needs to last for years and feel that the industry has really improved in quality. 4. What’s your favorite style/shape of bouquet? We create very lush, full, whimsical and natural bouquets. I’m best when letting the flowers tell me where they want to shine and allowing them to do just that! Full and very textural bouquets have always been something brides come to me for and I adore finding just the right way to create the perfect bouquet for each of my brides. I also consider the shape of the brides dress first in design because I really want the flowers to be her perfect accessory for the day! 5. Are there any flowers or plants you don’t recommend because they don’t last as long? There are several flowers and fillers that don’t do well in bouquets in Colorado. We are such a dry state with a very strong sun and flowers like hydrangeas and dusty miller don’t do well out of water here. Other flowers like clematis or poppies, which are gorgeous in a bouquet, really fall quickly to the sun and dry weather too. The most important thing to remember is if you love them and really want them in a bouquet, have your photographer capture your bouquet and key pieces first! In photos, the flowers like clematis and poppies are outstanding if captured right away when we arrive. I love what I do so very much and get so excited about each and every wedding/event! There is so much joy in creating around each person’s style, personality and dreams!